Welcome to this edition of Europe’s Digital Agenda. In this space I uncover and detail last week’s digital developments from across Europe, highlighting the most relevant news and forthcoming activities. 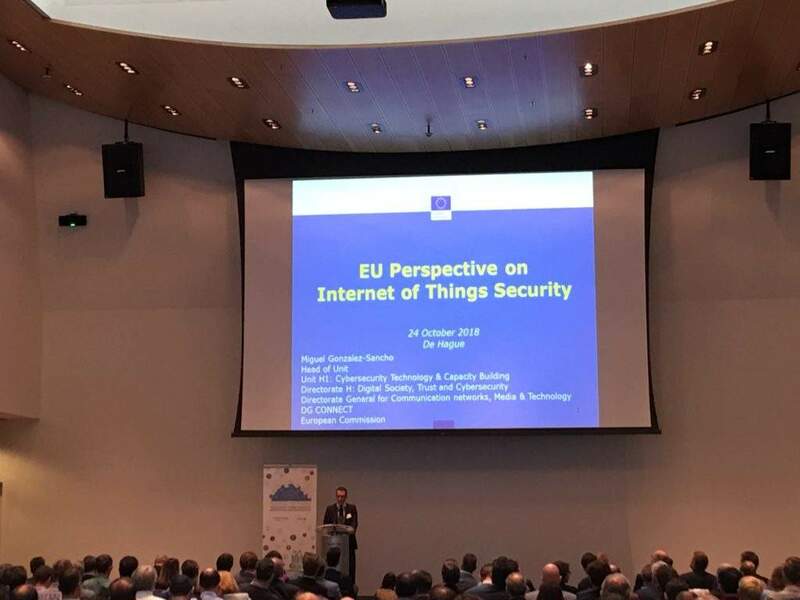 This week I was reporting from the Europol headquarters in The Hague for the second Europol-ENISA Internet of Things (IoT) Security Conference organised by Europol and by the European Union Agency for Network and Information Security (ENISA). The IoT Security Conference offered a platform for European cybersecurity experts to provide the audience with insights into the security requirements of IoT, a mapping of relevant threats, assessing possible attacks and identifying potential good practices and security measures to apply in order to protect IoT systems. The main topic discussed at the conference included the need for a shared IoT security regulation, tackling the cybersecurity skills gap across EU member states and strengthening partnership between the public and private sector. Last week, we had a busy week that included new investment in digital projects across Europe, governments’ initiatives to prevent cyberattacks and the second annual review of the EU-U.S. Privacy Shield framework. 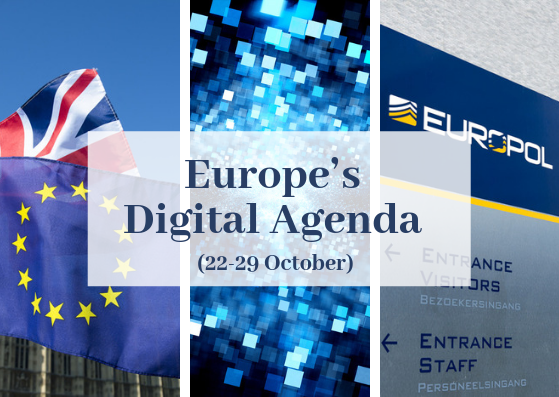 This week, we will talk about the main conclusion from the Tallinn Digital Summit, update to the Schengen Information System and new legislation against unjustified geoblocking. We will also discuss EU funding opportunities for digital initiatives and lessons from the Europol-ENISA IoT Security Conference. 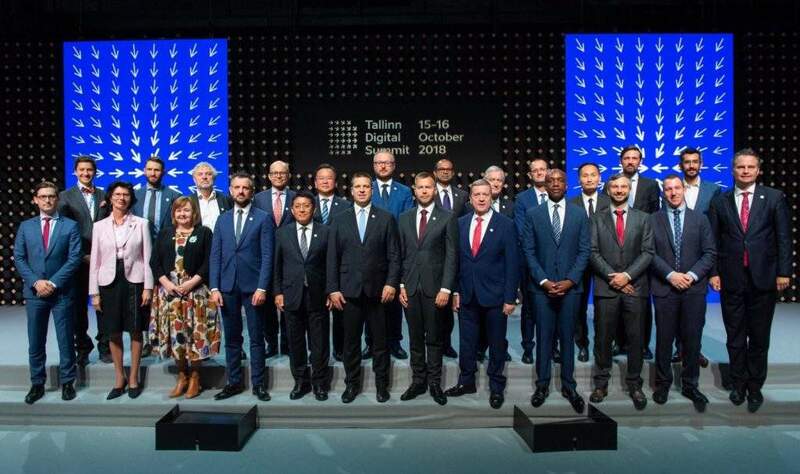 Held on October 15-16, the focus of this year’s Tallinn Digital Summit was on the potential and challenges of artificial intelligence (AI) in government, economy, and society. The Digital Summit is a meeting place for the Heads of Government and Ministers, policy makers, the tech community and influential thinkers of digitally-minded nations driving the global conversation on the implications of digitalisation on governments, economies and societies. This year’s summit focused on how AI and ‘free-moving’ data can be wielded in the service of digital states, economies and societies. The Estonian Prime Minister Jüri Ratas said, “AI and machine learning have already changed our lives and will bring even greater changes in the near future. We need to use these technologies wisely and responsibly to provide better and smarter services. “Cross-border trade of data and artificial intelligence are no longer science fiction. We need to envision our AI and machine-learning future and act now,” he added. Speakers said that AI has the potentiation to help public administrations tackle some societal problems such as climate change and life-threatening diseases. But on the other hand, it still remains flawed and subject to “wrong judgement”, may act unpredictably, and can be manipulated in certain ways that could pose “danger to humanity”. “Companies, sectors, and even economies that make bold investments in AI will likely see significant gains, while those slow to adopt risk falling behind,” said James Manyika from the McKinsey Global Institute. Given the potential of AI, policymakers and business leaders were called upon to recognise and embrace the challenges that the technology presents by giving emphasis to responsible use and legislating measures to facilitate adoption, improve AI-readiness, and manage negative disruptive effects. Policymakers discussed the role of European AI regulation, and stressed the need to lay the foundation for storing, processing, and exchange of personal data. For example, in Estonia, the proposed Kratt Law is now opening the discussion over the unintended consequences of AI and who has the legal liability if things go wrong. Online sellers currently can apply barriers and impose restrictions to consumers on the basis of their nationality or place of residence. Some examples are blocking access to websites across borders and denying the possibility to complete an order, to purchase goods or to download content when accessing a website from abroad. The European Commission has passed a regulation in February that aims to set an end to unjustified geoblocking. European policymakers believe that geo-blocking and other geographically-based restrictions undermine online shopping and cross-border sales by limiting the possibility for consumers and businesses to benefit from the advantages of online commerce. The Regulation entered into force on March 22 and will start applying on December 3. Within two years after the entry into force of the new rules, the Commission will carry out a first evaluation of their impact on the internal market. Members of the European Parliament (MEPs) have adopted three draft regulations that will update the Schengen Information System (SIS II), the most widely used information system for security and border management in Europe. SIS was established in 1995 after internal borders were abolished in the Schengen area. A more advanced version (known as SIS II) became operational in 2013. It is used in 30 countries throughout Europe and was consulted 5 billion times in 2017. The improved Schengen Information System is expected to contribute to the EU’s fight against cross-border crime, terrorism and irregular migration. Under the new regulation, member states will be obliged to share the details of terrorist acts with all European national authorities. Alerts on unknown persons who are wanted in connection with serious crimes and terrorism. Preventive alerts for children at risk of abduction (in particular parental abduction) and additional alerts on vulnerable persons at risk. Alerts on return decisions to help enforce decisions by a member state on returning an illegally-staying non-EU national to his or her country of origin. Currently only border control, customs, police, judicial and migration authorities have access to the SIS II database. With the reform, Europol will also be granted direct access to all alerts in the system. The European Border and Coast Guard Agency will also receive the alerts related to its tasks. Due to its partial participation in the Schengen acquis, the United Kingdom operates SIS II only within the scope of law enforcement cooperation. The UK started entering alerts into the SIS II system and consulting it on April 2015. However, it is not clear yet what the UK’s commitment to the SIS II framework will be after Brexit. Depending on the outcome of the Brexit negotiations, one of the possible scenarios sees the UK joining the Schengen Associated Countries club and continuing to use the SIS II only within the scope of law enforcement cooperation. Speaking at a conference in Vienna in June, the EU’s chief negotiator Michel Barnier said the UK would not be granted access to the European Arrest Warrant, or be allowed to shape the strategic direction of Eurojust or Europol in future. The ‘Smart City Cookbook’ brings together a set of examples that cities can utilise when planning and managing their smart city activities. The guide is based on best practices gathered from cities worldwide and supported with examples gathered in the city of Tampere’s smart city program, Smart Tampere. It defines the key elements for a smart city program and provides guidance on their implementation. For example it includes guidance and a template for creating a smart city program vision aligned to a city’s strategic vision. Nick Cotton, project manager for Smart City education and operational development at the City of Tampere, said, “At the heart of developing, sustainable and a safe city that offers high quality services are the citizens. People are at the center of innovation and change, and that is a message that is at the heart of this book”. The SME Instrument funding mechanism under the EU’s research and innovation programme Horizon 2020 will provide 246 selected small and medium-sized enterprises (SMEs) from 24 countries for financial support from. The SMEs will receive a total amount of £11m (€12.2m) to bring their innovations to the market faster. Each company will benefit from £45m (€50k) to create a business plan and will receive free coaching and business acceleration services. The majority of the selected SMEs work in the field of information and communication technology (ICT), health and engineering. Examples of the projects include a water-injection system to reduce NOx emissions from vehicles, a digital platform for hands-on cybersecurity training, a novel cancer therapy and a technology that dissolves wood waste to extract and reuse raw materials. SMEs can already apply for the next round of the EU funding scheme, which has a deadline of 13 February 2019. The Quantum Technologies Flagship, a €1 billion initiative, was launched at a high-level event in Vienna hosted by the Austrian Presidency of the Council of the EU. The initiative will initially fund 20 projects with a total of £117m (€132m) via the Horizon 2020 programme, and from 2021 onwards it is expected to fund a further 130 projects. The total budget is expected to reach €1 billion, providing funding for the entire quantum value chain in Europe, from basic research to industrialisation, and bringing together researchers and the quantum technologies industry. Just six days after it hired Nick Clegg as its head of global affairs, Facebook is facing a further risk to its reputation after the Information Commissioner’s Office (ICO) confirmed a fine on the organisation of £500,000 for serious breaches of data protection law. In July, the ICO issued a Notice of Intent to fine Facebook as part of its wide ranging investigation into the use of data analytics for political purposes. After considering representations from the company, the ICO has subsequently issued the fine to Facebook and confirmed that the amount – the maximum allowable under the data protection laws which applied at the time the incidents occurred – will remain unchanged. The European Commission has published the International Digital Economy and Society Index (I-DESI) that compare the digital performance of EU member states with those of 17 non-EU countries in 5 areas: connectivity, human capital and digital skills, use of internet by citizens integration of technology and digital public services. Denmark tops the ranking, followed by the Republic of Korea and Finland. Four other European member states are in the ‘top ten’ of the index: the Netherlands, the UK, Sweden and Luxembourg. European citizens can now vote for their favourite technological and scientific breakthroughs funded by the EU. The European Commission has launched a competition to identify Europe’s top future innovators. Citizens can now vote for the 20 innovators they think most deserve the Innovation Radar Prize 2018, which is open until November 12. 50 different innovations can be selected using the European Commission’s Innovation Radar, a data driven search engine which helps to identify high potential innovations and key innovators. Participants include SMEs, start-ups and universities located across Europe. The 20 finalists will get to pitch their plans taking their innovation to market to a jury of experts at the ICT 2018 event in Vienna on December 5. The European Commission has launched a public consultation on how Europe should build trust in connected and automated mobility services. This consultation aims to identify the main challenges linked to the deployment of connected and automated vehicles from the public and relevant stakeholders (such as car manufacturers, connectivity providers, service providers, telecom providers, end-users, and public authorities including municipalities, the health community, and civil society organisations). different aspects of technology needs for 5G large scale testing or pre-deployment. The input gathered from the consultation will feed into a new policy recommendation to be adopted by end of 2018/ beginning of 2019. The UK and the EU are close to agreeing a Brexit deal, Brexit Secretary Dominic Raab said on Thursday. Raab said, “We have made good progress. We are close to agreeing a deal. There certainly is a risk of a no deal especially if the European Union engage in a deliberately intransigent approach,” Raab added. Concerns are also growing that the UK will face a Brexit ‘data wall’ that will stymie the £240bn of trade in Europe that relies on data flows, UK Digital Minister Margot James admitted last week that substantive talks on data sharing between the EU and UK were yet to start. James said that she was optimistic that a decision could be made during a 21 month transition period that is set to follow the UK’s formal exit from the bloc next March. In the meanwhile, NAO highlighted IT systems risks facing a Brexit ‘no deal’ scenario. Many of the key risks to UK border operations if the UK leaves the EU without an agreement on 29 March 2019 hinge on the need to have effective IT systems. But ongoing political uncertainty and delays in negotiations have hampered the effectiveness of departments’ border planning and delivery. This has reduced the time available to plan and implement new border regimes that might be required, the National Audit Office (NAO) has highlighted in a critical report. In terms of departments’ progress in implementing changes at the border, the majority of the changes required at the border relate to ensuring that there are effective computer systems in place to collect revenue and information; sufficient numbers of trained people to operate the border; and sufficient supporting infrastructure to enable compliance activity to take place. Many of the changes needed to be made by government under a ‘no deal’ scenario may not be ready on time, according to the NAO. In particular, 11 of 12 critical systems needing to be replaced or changed to manage the border were at risk of not being delivered on time and to acceptable quality. And new infrastructure to track and physically examine goods cannot be built before March 2019. Without this, the UK will not be able to fully enforce compliance regimes at the border on day one, the NAO says. Departments use information that is stored in a range of systems to help enforce the border. Border officers use this information to allow appropriate border crossings to be made, to make judgements about risk and then to target their enforcement activity. Exiting the EU could result in departments having limited or no access to some of the key EU systems they currently use. Digital, Culture, Media and Sport (DCMS) Committee chairDamian Collins to speak at a Guardian event on the social and ethical impact of technology. UK Information Commissioner Elizabeth Denhamto deliver a lecture on supervising tech giants in a digital age at the Institute of Economic Affairs. UK Exiting the European Union Minister Suella Braverman to speak at a Chatham House event on protectionism, power dynamics and changing priorities. Bank of England meeting regarding inflation report. Facebook hired Nick Clegg, Britain’s former deputy prime minister, to run its global lobbying efforts. Canton of Solothurn in Switzerland is looking for a digital partner to help develop their “eGov portal” project. The canton wants to set up a platform for the meaningful implementation of the eGovernment services, which offers the possibility during the transfer processes to sufficiently identify the counterpart of a transaction as well as secure communication and delivery of documents administrative processes between authorities and citizens or companies. The city of Nitra in Slovakia has issued a £448k tender for the provision of services for the operation and maintenance of information systems from Cora Geo, s.r.o. (CG ISS), Geographic Information Systems (CG GISAM and CG WebGIS), eGovernment Support Solutions (hereinafter CG eGOV) and related activities. The workshop will also include sessions dedicated to medical devices as well as to emerging technologies in eHealth security such as blockchain.